African Artificial Intelligence Pioneer And Cortex Logic CEO, Dr. Jacques Ludik, Awarded AI Leader Of The Year. 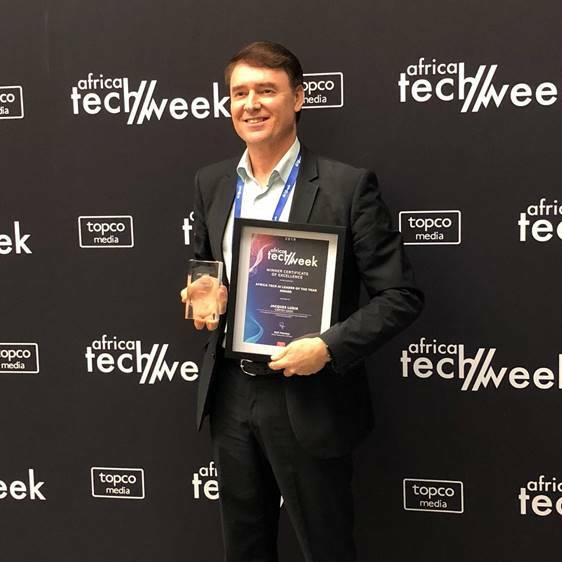 Cape Town: South African based Artificial Intelligence Software & Solutions veteran and founder of Cortex Logic, awarded premium accolade at Africa’s Tech Week event, underlying a life dedicated to AI and Data Science Innovation. Dr Ludik is an African based smart technology entrepreneur and Artificial Intelligence investor / AI ecosystem builder, holds a PhD in Computer Science and has amassed 25+ years’ experience in the study and exploitation of AI & Data Science in real world applications. Ludik was formally a founder of Bennit AI, Mosaic, SynerG and CSense Systems, the latter being Africa’s first AI company sold to General Electric in 2011. Over his career Jacques has published a wide range of papers on AI, Advanced Analytics, Machine Learning and Data Science and is a big supporter of AI for social good. He is currently Founder & CEO of Cortex Logic and Founder & President of the Machine Intelligence Institute of Africa (MIIA).